Rodrigo Duterte rode to the presidency of the Philippines through a wave of social media promotion. But the homicidal world leader, who has overseen the murder of over 20,000 people in a brutal crackdown on alleged drug dealers and users, isn’t too happy with Facebook these days. Duterte claims that Facebook’s newest initiative to smoke out fake news is biased against his government. Facebook announced last week that it would be partnering with two groups, Rappler IQ and VERA Files, to fact-check news that appears on the social network in the country of 106 million people. 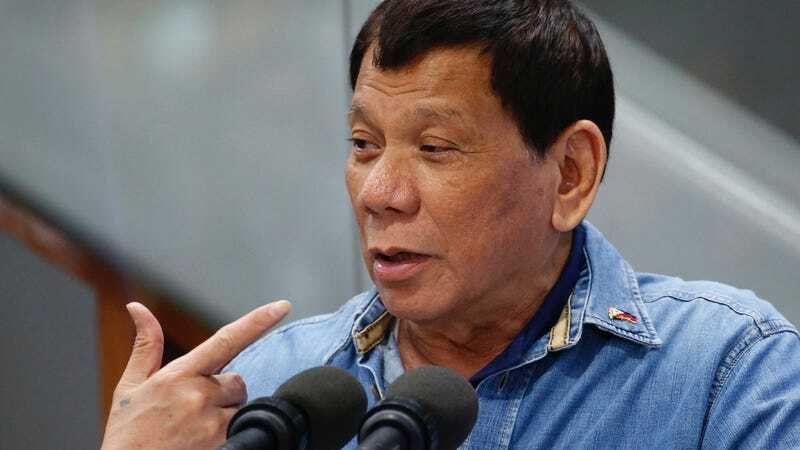 President Duterte has previously claimed that Rappler is funded by the CIA and that the news organization, which is often confrontational to his regime, is out to get him. “We would also like to register our protest at the choice of fact-checkers by Facebook and this will be on the agenda when we finally get to sit with them soon,” said Loraine Badoy, assistant secretary at the Presidential Communications Operations Office, in a statement to Reuters. Back in February, Duterte banned Rappler reporters from his events, claiming that they’re in violation of foreign-ownership rules regarding media companies. But Facebook says that organizations like Rappler and VERA Files are vital to policing its platform in a new era of “transparency” after Facebook recently drew fire for allowing fake news to spread around the globe. Facebook has been blamed for everything from helping President Trump get elected in 2016, to being complicit in the genocide currently taking place in Myanmar. “Partnering with third-party fact-checking organisations is one of the ways we hope to better identify and reduce the reach of false news that people share on our platform,” said Clair Deevy, Facebook’s Director for Community Affairs for the Asia-Pacific region, in a statement from last week. Rappler says that it’s 100 percent owned by Filipinos, but admits that organizations like the Omidyar Network and North Base Media have made investments in the news company. The Omidyar Network was founded in 2004 by eBay billionaire Pierre Omidyar, who also owns the US-based news organization The Intercept. Omidyar and his wife’s deep ties to the Obama White House are perhaps one of the reasons that Duterte thinks Rappler has been compromised by the American security establishment. The average social media user in the Philippines spends more time on social media than anyone else in the world, and it’s a rapidly growing market for companies like Facebook, which wants to see the average user break the 4-hour-per-day benchmark that currently puts them in first place globally. But Facebook is always balancing the demands of government with its desire to stay within the confines of local laws—even when those local laws run counter to what many would consider accuracy in journalism. Gizmodo has reached out to Facebook for comment, but the company is often as difficult to get a frank statement from as any authoritarian regime. We’ll update this post if we hear back.